Happy Travels by Jack is an app designed by (wait for it…) a five year old! Helped on the technical end by his mom and dad, Jack has created an adventure game where the player completes “chapters” in the game to get to the next chapter. According to this article, “The artwork and imagery in the game are entirely of Jack’s own design, which he creates using pencils and Crayola® crayons. Everything from the backgrounds to the vehicles to the enemies are dreamed up and drawn by Jack. Mommy then scans the illustrations and Daddy codes them to come to life exactly as Jack envisions them.” The game is a great example of family engagement and cooperation. After several introductory screens, and links to books available for purchase, the player can finally begin the game. 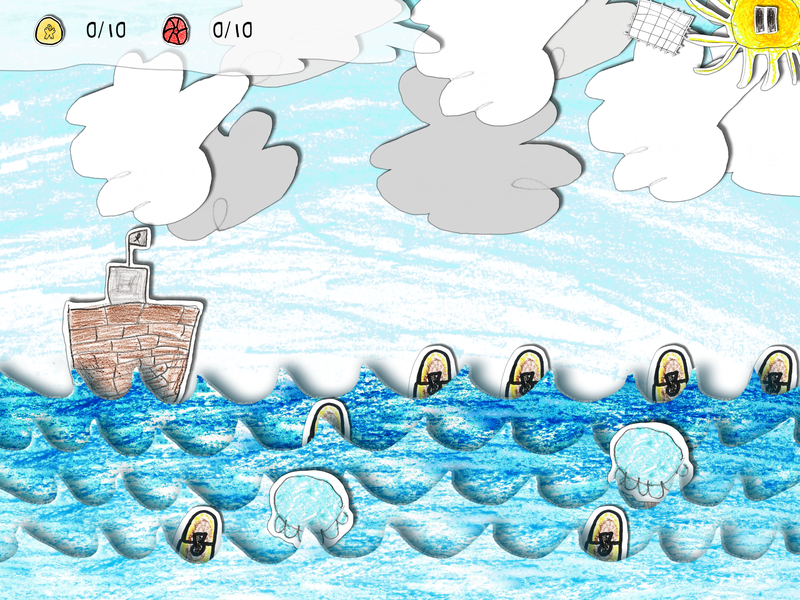 Using a finger to control a boat, the player must avoid treasure stealing jellyfish and capture the treasure chests. Once the player has collected 10 each of two kinds of treasure, the next chapter is opened. I’m not a five year old. I get that. But I found the first “chapter” to take quite a while to play and was getting irritated and tired of it by the time I earned enough treasure to get to the second chapter. Imagine my dismay when the second chapter was more of the first, but with swarms of chewing fish that eat holes in boats instead of jellyfish that just steal my treasure. I ran my boat into the fish just to make it stop. Unless you successfully complete the second chapter, you can’t go on to the others, and frankly, I don’t want to know what happens next badly enough to endure chapter two. This was obviously a money making endeavor for Jack and his folks, which is a wonderful thing. But I found the number of in-app purchases to be off-putting. I doubt I would put it in the hands of a child for that reason alone (I REALLY dislike in-app purchases, but that’s just me). I liked that Jack did the artwork himself, and I liked the bit of story that we were given. I would have liked to have seen more story, but we might have to wait until Jack is, I don’t know, six? It was a fantastic first effort, and could be used as inspiration to other children to show them what children can do. Posted on July 21, 2014, in Apps and tagged Awnali Mills. Bookmark the permalink. Leave a comment.